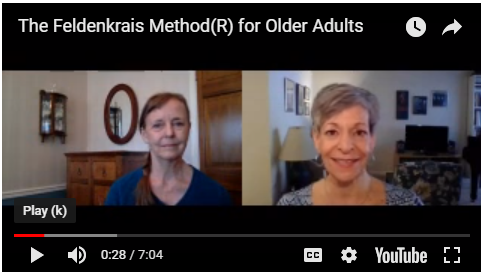 Can Older Adults Benefit from the Feldenkrais Method? Having reached the age where there’s a Beatles song about my very next birthday, my research and interest in the “older adult” has become obsessive more focused and curious. Options for physical activity, as presented in popular media, seem oddly polarized between extreme, “drag-this-truck-tire-across-the-gym” workouts and Netflix binge-watching. For those of us seeking an effective, yet sustainable way of keeping fit and active, the way out of that dilemma seems murky and lacking viable choices. I was encouraged, yea even thrilled to read some recent research from Columbia University that showed replacing 30 minutes of daily sitting, with ANY form of activity, of ANY intensity, cut the risk of early death by as much as 35 percent! That’s a significant benefit for you if you are considering possible advantages of attending a Feldenkrais class on a regular basis! My colleague and long-time friend Becky Behling reminded me of a key advantage of the Feldenkrais Method over other, more conventionally adopted “interventions” available to older people: your own movement knowledge from the Method is always available to you, in any moment, to find a way to move and feel better. You can hear my whole conversation with Becky in this short video. Be sure to watch to the end, as Becky shares a simple and gentle movement that will improve your posture and upright alignment instantly. With 2019 well underway and the Groundhog staring at us, we hope to help you to have the best new year ever. I don’t know about you, but I’m inspired to get moving….